Are you looking for a concise, proven, effective program to combat substance abuse, gang activity, aggression and violence, and other forms of delinquency? These gang intervention and gang prevention resources provide programs with a range of options which can be tailored to specific program or facility needs. Facilities interested in these programs would include halfway houses, neighborhood centers, day reporting programs, group homes, and neighborhood centers. We provide several programs which are based on a selection of individual lessons which can be delivered by direct custody staff, counselors probation officers, social workers, or other professionals. They are designed for the "open group" setting, and address the key risk factors underlying gang involvement, substance abuse, and other delinquency. These detention, diversion or drug court models range from 15-30 program sessions. And, we have extensive resources suitable for longer gang intervention programs. They include resources based on motivational interviewing/motivational enhancement (MI/MET) and cognitive-behavioral therapy (CBT) materials, relapse prevention resources, skills building materials, and resource targeted toward girls and participants who read Spanish. All materials have been developed in a high interest, easy-reading format. In addition, we provide detention, diversion, and drug court programs with a set of gang intervention materials based on a series of videos, with accompanying workbook activities. Other gang intervention resources include materials designed to address vocational readiness, life skills, substance abuse, aggression, violence, and anger management. These program resources are based on state-of-the-art evidence-based models. They include significant elements of cognitive-behavioral therapy (CBT) and motivational enhancement therapy (MET), including specific tools for motivational interviewing (MI) in each of the workbooks. Cognitive-behavioral therapy (CBT) promotes re-evaluation of dysfunctional emotions and behaviors to bring about change. Motivational enhancement therapy (MET) seeks to promote change by making the client aware of problems and consequences of behavior. The motivational interviewing (MI) tools we provide are non-confrontational and gently provoke awareness. We can work with you to customize a gang intervention curriculum using cognitive-behavioral therapy (CBT) and motivational enhancement therapy (MET) techniques specifically to the needs of your facility or community program. Listed below are some of our more popular program options. A 25 hour-program consisting of worksheets, activity cards, and other activities. Features a high-interest, easy reading level (Grade 4). Includes a selection of group discussion scenarios ("What Do YOU Think?"). Built on a proven motivational enhancement (MET) and cognitive-behavioral (CBT), this 25-hour curriculum is designed to reduce resistance, build participation, and guide the process of change. Approximately 23 hours of programming to maximize flexibility for a relatively short program. These materials are easily expanded with additional material or activities, and can be used independently from each other. This can also be used in probation programs. The Preparation for Treatment program includes 20 hours in six workbooks designed specifically as a preparation for treatment program for juveniles in detention, day reporting programs, neighborhood centers, halfway houses, and group homes. What Do YOU Think? scenarios available. What�s Going On In My Life? 20 hours/sessions with session openers, core lessons based on risk factors, closing applications, and step-by-step lesson plans. 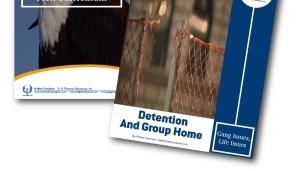 For short-stay populations in day reporting, detention centers, halfway houses, neighborhood centers, and group homes, these materials are flexible enough to allow participants to enter or exit at any point. This curriculum was designed for short-stay populations and for easy delivery. Each lesson follows the same plan with the goal of delivering a sound coping skill called Stop-Think-Act. Each lesson is fully scripted so that staff with minimum experience can successfully deliver it. Program covers a wide range of critical risk factors in 30 hours of programming, divided into six parts (five sessions each). Let us customize a program that's right for your detention, diversion, or drug court program. Our programs are tailored to the needs of our customers. We can provide models as short as 12 hours and as long as hundreds of hours.